This last week has been interesting. This last week I saw my first dust storm, called "haboob", wow! I have never experienced anything like this before. Dust absolutely everywhere and thick enough to turn day into night. Our appointments have been canceling like crazy and we've had very few investigator lessons, but we had a good amount of less active lessons. One such less active we are focusing on is Barry. He served a mission a long time ago, and eventually became less active, but we've had just a couple lessons with him and guess what, he came to church! I must say, I did not expect that to happen, but then again, I did; it was a welcome surprise. I wish I could had talked with him more at church, but he left after Sunday School and I was busy interpreting the whole time. He said he would come again next week too and we have an appointment with him this week too. It's pretty exciting. We also just got an investigator from the Mesa Branch complete with a fellowshipper too! He's super excited to learn and his fellowshipper (his girlfriend) is pretty awesome and very strong in the gospel. I can't wait to see him progress. It just goes to show that flirting to convert works in some cases (NOT TRUE), and not everything may work out in one area, despite our efforts, but if we're faithful, it will be made up in others. NOTE: 1 NEW PICTURES! CLICK ON THE PICTURES TO THE RIGHT TO VIEW THE PICTURE ALBUM. This last week was fantastic. Several things changed around. Elder Walker was emergency transferred to Show Low, a city in the mountains and Elder Riggs came down from the mountains to replace Elder Walker. Now the exciting stuff. Late one afternoon, one of our less active members texted us and said that her daughter, who was also less active, was not doing too well, both physically and emotionally. She's been having a lot of stress and wanted us to come over and give her a blessing. She lived quite a ways away and it was already getting late, and strangely enough, our appointment for that evening was cancelled. Probably not a coincidence! When we arrived there, Elder Riggs shared a seminary video about accountability as the dad finished watching his basketball game. Elder Riggs is wonderful, by the way. 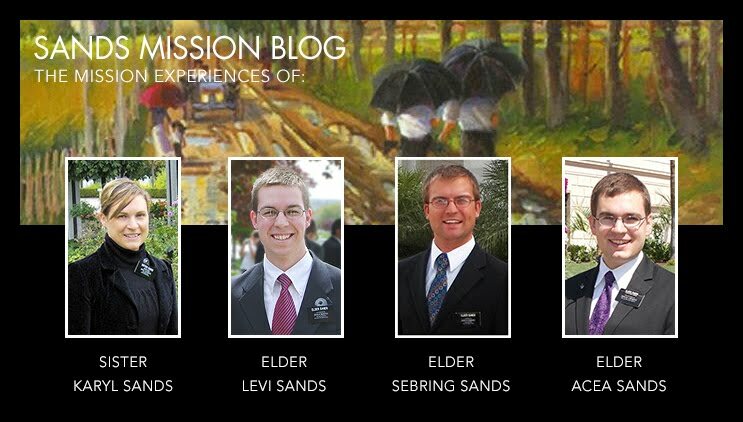 He's extremely happy, very positive, complimentary, and effective at missionary work. Anyways, not only did that invite the spirit, but it also engaged the children, and the mother of the children was very touched by the video and said afterwards, "That was the message I needed to hear." Then when the dad finally joined us (I didn't know deaf people were into basketball as much as hearing people), we gave a blessing to the mother and her grandmother. The mother asked me to give the blessing, which I was so honored to do. I've given blessings before, but the mother and I were close friends and I could feel the words just flowing through me as I gave that blessing by the power of the Holy Spirit. Then through many tears, she graciously thanked us. I was so happy for her and really felt a true Godly love for her. I've never really quite felt like that before, and I’m curtain that it's just a fraction of what our Heavenly Father feels for each of us. I never want to forget that experience. We just recently moved to a new apartment! Here's a picture of how MY COMPANIONS organized it. Notice how there is one spot that is completely trapped during the night (has to climb over people to get in and out) and, of course, that's my spot. A member visited from Sandy Utah and her and her husband (and dog) are wonderful! She made us the fancy ties we're all wearing. All clouds outside and still 106°. How is this possible!?! Well enough of the trivial news, we had a great week. One of our less active members who we’ve been working with for a while finally came to church with his less active daughter and two of his investigating granddaughters. It was so wonderful to see them there and it was probably the best Sunday for them so show up as we had some of the most marvelous testimonies born. Our investigator who is close to baptism said a few weeks ago that she has not been feeling the spirit at church, but this week changed it all around. We had a lesson with her two weeks ago and we discovered that she was not keeping the word of wisdom. We discussed it seriously with her for a while then, at the end, we offered to give her a blessing. She accepted and we blessed her that she would be able to trust God and find the knowledge and courage to quit. The next week she said she felt like it was just stupid to drink coffee and had not had any the entire week. That was such a miracle. During our Fast and Testimony meeting, I took the advice of my mission president (which was for all the missionaries to bare their testimonies that Sunday) and bore my testimony with two hopes: First, that what I would share would strengthen the less active members and our investigator. Second, a testimony grows in the bearing of it. So, I bore my testimony, and afterwards, I thought about what I had said-had I left the impression that I had wanted to leave. I kind of felt like I didn’t. I had given far more powerful and spiritual testimonies many times. But, when I went to go talk to the less active members and our investigator after church, they said they felt the spirit so strong and were extremely grateful to me. I am so thankful for testimonies and the power that they can hold. This week I would like to discuss a marvelous new piece of technology that has just been introduced in our mission: the iPad (mini). I know every mission around ours has had them for a year or so now but we're finally on the same playing field. We can check our emails every day, we just can't respond to them till Monday. We're limited to 25 specific apps we can download, but we as ASL missionaries will be getting approval for ntouch (our VP app) and some other signing text app. It's so nice having all the things we will ever need as missionaries on one small device that we can carry around with us anywhere we go. I'm also starting to do a bit of family history work because our mission temple day is in a couple of weeks and they want each of us to have at least one family name. I just then realized that I'm good with getting our investigators signed up and putting their parents and grandparents and family on there, but I haven't the faintest idea what to do after that. With a little bit of help though, I'm getting the hang of it. I might have to get a keyboard for this iPad because hand tapping this virtual keyboard is a little hard and a lot slower. Anyways, I thank you for all you support and prayers!